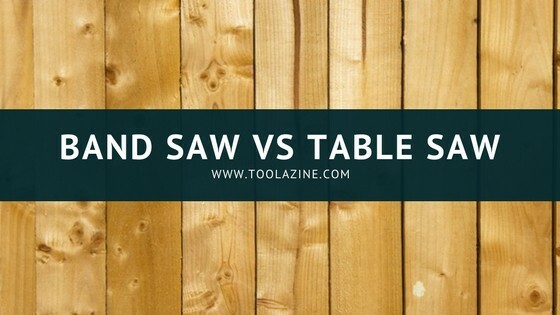 Toolazine Band saw vs table saw: What are the differences are which one woodworkers need first? Band saw vs table saw: What are the differences are which one woodworkers need first? Both band saw and table saw are great tools that deserve a place in your garage. If you often visit tool shops, you can notice that they stand next to each other on the shelf. And which one is more important? Which one woodworkers need first? Consider what are you going to do with the tool – depth-cutting, along with rip-cuts and crosscuts for a new piece of furniture? Or you need curved edges and you prefer using plastic instead of wood? Answering these questions will guide you into making the right pick. There are other factors to consider, but fortunately, you are in the right place. This article will cover more than just the basics, so don’t wait for any second longer and take a look at the categories you will read about. So, the table saw is most commonly used saw in workshops, but also by individuals. However, there are tasks that could not be achieved with, so you will need a band saw. None of the machines is perfect, both have pros and cons that we will go through. Different situations will require using a different saw, and this article will guide you through most of them. Another important thing is to learn how to properly operate with the machine. And what machine should you buy? We have the top picks of 2018 just for you. You don’t listen to people discussing much this tool, although they should be doing that rather than sticking only to the table saw. But why should they do that? What advantages does the band saw have over the table saw? The band saw can help you with cutting timber, plastic or metal – don’t be surprised if you hear that someone uses it even for cutting meat, this saw is great for a range of different materials. If you intend to cut different materials, a band saw should be your pick. However, notice that you will need to change the blade often according to the material you are cutting. As a woodworker, you will notice that some jobs require curved edges and this saw type is ideal for that. Plus, band saws are quieter and don’t produce as much dust as table saws. When I talk about dust, I am not much concerned about the fact that you will need to clean less, but I care about the health issues that can be the result of the dust. As you can see, woodworking without a table saw is possible. However, there are situations where the band saw will not be the best pick. What are those? When you finish a cut, you can’t expect edges as you would with a table saw, so the edges might be rough and will need additional finishing. Plus, although it can cut a variety of materials, the band saw can’t perform a variety of cuts. In order to get a visual, I suggest taking a look at this video. You will learn easily what a band saw is and how to use it. The technology is changing every day, so you should try to follow it. In addition to that, here are the best selling band saws in 2018. See my detailed review of the band saws for woodworking. A tool that is a synonym for power – the 3.5 Amp motor will cut boards up to 6” with a precision you can’t imagine. It comes with a variety of blade options, it has a two-speed operation and unlike many modern machines, it can make bevel cuts from 0 to 45 degrees. It is packed with additional accessories like flexible work light, a miter gauge, special dust port, and a stand to keep your saw elevated. You can check the current price for the WEN3962 Two-Speed Band Saw here on Amazon. If you are looking a band saw for bigger projects, this is the tool you need to consider. Cutting irregular shapes and ripping lumber into extra thin pieces is not a problem for the 2.5 Amp motor that combines with a 9-inch blade. You get a miter gauge, rip fence, as well as attached LED light to the machine, for easier cutting with maximum precision. You can check the current price for the SKIL 3386-01 Band Saw here on Amazon. If your intentions for buying a band saw include cutting strut, pipe, angle iron, and a huge variety of other materials, this model will satisfy your needs. It has a capacity of 5” and it has a speed trigger for fast and accurate cutting. Cutting darker boards won’t be a problem, thanks to the LED light attached to the saw, and you can always hang your saw on the specially designed hook. However, this is a bare item, which means a battery is not included. Check the latest price for the DEWALT DCS374B Band Saw here on Amazon. This type of saw is basically a circular blade attached to an arbor that is run by a motor. It is a stable and most common way of getting accurate cuts. When is it best to cut using a table saw? If you require depth cutting, consider the table saw. The blade can move up and down in order to achieve the right depth level you need. Because of this, many people prefer to use a table saw for making furniture. As you may have noticed, workshops rely on the table saw as their main type of saw. The table saw delivers millimeter precise cuts and if your job requires rip-cuts and crosscuts, you should stick to this saw. I mentioned that the blade can be adjusted to different heights, and thanks to that you can make a variety of different cuts. It is a versatile tool, that is a must-have. However, it is not perfect and it has several disadvantages. Most of the saw injuries annually happen on a table saw. Whether this is because of the improper use, because of lack of concentration, or some other reasons, it is a fact that you need to be very careful when operating with it. To increase the accuracy, people will suggest you use crosscut and panel sled. However, they are also increasing the safety, as using a sled will reduce the chance of a kickback down to a minimum. To learn how to cut with a table saw safely, consider this video. If you want to learn more about the sled, how to use it or how to build one, feel free to check my article. Another disadvantage is the ability to make smaller cuts. Yes, the table saw is great for furniture, as that requires bigger and longer pieces of wood, but if your task requires paying attention to details, the table saw won’t be able to help you. And finally, the table saw is ideal for cutting wood, and unlikely the band saw, you may face issues if you try to cut other materials. You can always build a table saw, but in case you want to buy one, here are my recommendations. DEWALT constantly puts effort into creating great machines, and this one is not an exception as well. Fast, accurate and smooth cuts are what every woodworker want and what this table saw can offer. Depth cuts at different angles can be done with ease, and you don’t need to worry about the dust as the vacuum system will take care of it. Plus, you get a 10” blade, a rolling stand, miter gauge, as well as a push stick. See the full Dewalt DWE7491RS review or just check the latest price for the DEWALT 7491RS Table Saw here on Amazon. Another great tool from DEWALT – this one can make accurate cuts in a capacity of 20”, thanks to the 15 Amp motor. It will provide you with consistent and powerful performance, and with the guarding system, it is easy to set up the machine for a variety of applications. Tis table saw is portable, so you can easily transport it to the job site. Check the current price for the DEWALT DW745 Table Saw here on Amazon. As a DIYer, there is no other machine you should consider – projects in and around your house can be easily done with this tool. Rip-cuts, crosscuts, miter or bevel cuts, none of this would be a problem for this table saw. Your work will be supported by an aluminum table, and with the EZ measurement system, you will succeed in making accurate cuts in no time. You get a folding stand, rip fence, miter gauge as well as blade wrenches for better user experience. Check the current price for the SKIL3410-02 Table Saw here on Amazon. Once we covered the basics, let’s face these saws according to their ability to perform particular tasks. Regarding this criteria, it is not difficult to notice who wins this battle. Definitively, the table saw is the better pick if we compare range of activities. But, the table saw would deal harder with materials other than wood, and you can’t cut small details with it. That is why you might want to consider the band saw. To sum up, both saws have pros and cons, so the pick should be done according to the tasks you are about to do and the materials you are about to cut. What is your favorite? Which one would you go for? Share your opinions in the comments section below.